Los Alamos National Laboratory scientists recently flight tested a new rocket design that includes a high-energy fuel and a motor design that also delivers a high degree of safety. “What we’re trying to do is break the performance versus sensitivity curve, and make a rocket that’s both very high-energy, as well as very safe,” said Bryce Tappan, an energetic materials chemist at the Laboratory. “Typically, when you look at a propellant that’s high-performance, it’s not as safe a material.” See the flight tests and hear how Tappan and his research partners at New Mexico Tech and Penn State accomplished a fully successful flight in a new video on the Laboratory’s YouTube Channel. Conventional solid-fuel rocket motors work by combining a fuel and an oxidizer, a material usually rich in oxygen, to enhance the burning of the fuel. In higher-energy fuels this mixture can be somewhat unstable, and can contain sensitive high explosives that can detonate under high shock loads, high temperatures, or other conditions. The new rocket fuel and motor design adds a higher degree of safety by separating the fuel from the oxidizer, both novel formulations that are, by themselves, not able to detonate. After years of development and bench-top static tests, the new rocket design was recently flight tested at the Energetic Materials Research and Testing Center’s Socorro launch site, part of New Mexico Tech. The new rocket design was tested against conventional, high-energy commercial rockets to enable a comparison of data gathered on velocity, altitude, burn rate, and other parameters. Researchers will now work to scale-up the design, as well as explore miniaturization of the system, in order to exploit all potential applications that would require high-energy, high-velocity, and correspondingly high safety margins. Israel on Tuesday launched a missile over the Mediterranean in a joint exercise with the United States that came as Washington mulls punitive air strikes on Syria. Speculation mounted after the missile firing at 0615 GMT, with Russia’s defence ministry saying its early-warning system had detected two ballistic missile launches from the central Mediterranean sea fired towards the eastern coastline, where Syria is located. But the Pentagon said the exercise had no connection to possible attacks against the Syrian regime, and that it was a standard drill designed to assess Israel’s missile defences. “This test had nothing to do with United States consideration of military action to respond to Syria’s chemical weapons attack,” Pentagon spokesman George Little said. US President Barack Obama said earlier he was confident of winning congressional approval for military action against Syria that would involve cruise missile strikes launched from US warships in the Mediterranean. Only after the Russian reports did Israel’s defence ministry announce it had carried out the missile test. “The Israeli defence ministry and the American MDA (Missile Defence Agency) Tuesday morning at 9:15 (0615 GMT) successfully launched an Ankor-type radar missile,” it said in a statement. “The test was launched from the Mediterranean and directed from an army base in the centre of Israel,” it said. The defence ministry statement mentioned only one missile. The test involved a new version of the Ankor (Sparrow) missile “and was concluded at… a test range over the Mediterranean Sea,” a separate Israeli defence ministry statement said. The missile was to test missile tracking capabilities, local media reported. Prime Minister Benjamin Netanyahu lauded Israel’s missile defence capabilities. “Our security depends on Iron Dome (the country’s vaunted missile defence system), and our will of iron, which are the things that will give us the power to defend ourselves,” he said at the opening of a technology park in central Israel. Russian news agencies said Defence Minister Sergei Shoigu had reported to President Vladimir Putin about the event, which comes amid growing expectations of Western military action in Syria. Putin, a vocal critic of the West’s policies on Syria, has expressed strong doubt that Syrian President Bashar al-Assad was behind an alleged chemical attack on August 21 that has prompted calls for military action. Obama’s decision on Saturday to ask Congress to authorise military action against Syria lifted the threat last week of immediate strikes against Assad’s government. Netanyahu said on Sunday Israel was prepared for “every possible scenario” in Syria, as Israelis rushed to collect gas masks, fearing possible reprisals against the Jewish state for US-led military action against a hostile neighbour. But President Shimon Peres ruled out Israeli involvement in any intervention. “It is not for Israel to decide on Syria, we are in a unique position, for varying reasons there is consensus against Israeli involvement. We did not create the Syrian situation,” he said. The Javelin missile recently demonstrated the ability to engage targets beyond its current maximum range requirements. 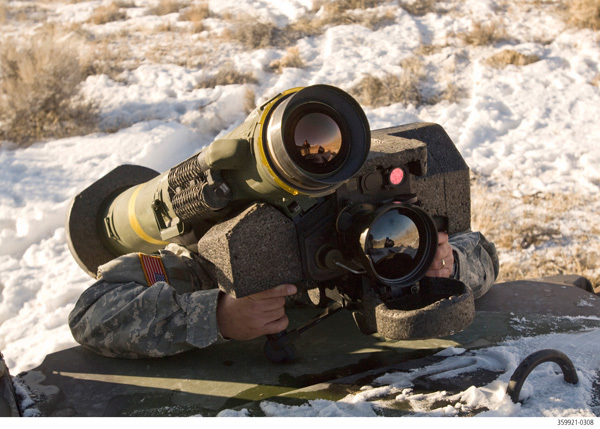 During the U.S. Army tests, the Javelin system acquired and engaged targets up to 4,750 meters. This capability would position the missile to better fit with remote weapon station (such as the Protector) where more powerful target acquisition systems are readily supporting extended range, while the weapon itself was not originally designed to perform at the longer range. “These tests prove that, under favorable conditions, Javelin can have reliable, solid performance as a close-combat weapon system well beyond the current maximum range requirement of 2,500 meters,” said Duane Gooden, Javelin Joint Venture president and Raytheon Javelin program director. “There were two direct hits on the threat representative target at the extended range.” Demonstrating Javelin’s extended range performance will further enhance survivability of the dismounted Javelin gunner in combat. Raytheon and Lockheed Martin are partners in the Javelin Joint Venture. Developmental testing for an F-16 operational flight program will be accomplished at the 40th Flight Test Squadron and 85th Test and Evaluation Squadron here for the first time. “This not only gives DT and OT pilots the unique opportunity for daily face-to-face contact to discuss potential test issues, but also allows OT pilots to participate in DT missions alongside their counterparts,” said Beau Booth, the F-16 M7 OFP project specialist for the 40th Flight Test Squadron. “In the DTO phase, a few early versions of the software, with limited subsets of the planned new capabilities, are flight-tested to ensure basic functionality so the software engineers can easily make any fundamental changes before they get too far into the coding,” said Booth. This takes on a greater importance with this new OFP because it’s the first time an Air Force unit has developed the software. Previous F-16 OFP updates were created by Lockheed-Martin, but the 309th Software Maintenance Group from Hill Air Force Base, Utah, is the developer for this iteration. This was not the case with this DTO phase, however, since both OT and DT pilots were available to participate. To date, the combined test team has flown 41 test sorties. The previous F-16 OFP DTO included only 13 test sorties. “The ability to conduct a fully integrated DT/OT test program allows us to test new OFPs more thoroughly and field them faster and cheaper than ever before,” said Booth. Historically, even though an OFP passes DT, OT pilots would find new software errors due to the amount of flight time and pilot availability. The added use of OT resources increases the potential of finding anomalies in the software. It also gives OT pilots, who are ultimately responsible for the final fielding recommendation, a chance to evaluate the software development early. OT’s upfront involvement cuts down on any late software changes. It also avoids the associated extra test requirements, increased costs and fielding delays that could happen. The aircraft carrier USS Nimitz (CVN 68) received and refueled an MV-22 Osprey, a potential replacement for the C-2 Greyhound, for the first time Oct. 6. The Osprey, assigned to Marine Medium Tiltrotor Squadron (VMM) 165, was the first from (VMM) 165 to make a carrier-based landing and was part of an on-going initiative from the Joint Program Manager Air (PMA) 275 office to increase the number of available platforms. Johnson embarked Nimitz as a liaison between the pilots of the MV-22 and Nimitz’ primary flight control. As the subject matter expert, Johnson was able to provide the Nimitz crew with information about the MV-22 to aid in the recovery of this aircraft. Since this was the first time the Osprey landed on Nimitz, though similar to standard Navy aircraft, there were some things the flight deck crew had to be mindful of. Nimitz sent some of its flight deck crew to Marine Corp’s Air Station Miramar, Calif., for training on how to handle the Osprey. This training played a key part in allowing the Osprey to make its first carrier-based landing on Nimitz and turned out to be a unique experience for the crew. Landing the Osprey will be another memory Nimitz’ crew will be able to add to the long history of the ship. General Atomics Aeronautical Systems, Inc. (GA‑ASI) today announced that it has completed the successful integration and operational testing of its Lynx Multi-mode Radar, a next-generation capability that integrates Synthetic Aperture Radar (SAR), Ground Moving Target Indicator (GMTI), and Dismount Moving Target Indicator (DMTI) radar. Testing was conducted in May by the U.S. Department of Homeland Security (DHS)/Customs and Border Protection (CBP) out of its National Air Security Operations Center in Grand Forks, N.D. CBP continues to utilize an earlier Lynx variant in day-to-day border search operations aboard its Predator B RPA, also manufactured by GA-ASI. The Lynx Multi-mode Radar expands agent situational awareness significantly, enabling them to detect, locate, and improve high geo-location accuracy of a much wider range of moving targets. It also enhances the system’s ability to cross-cue Predator B’s other onboard sensors to pursue high-value targets and allows for improved target tracking. Integrated into CBP’s Predator B, Lynx Multi-mode demonstrated several significant performance achievements during the test, meeting all of CBP’s required specifications for the radar. The DMTI mode allowed agents to detect both very slow-moving vehicles and personnel moving (dismounts). In addition, the ability to select a GMTI/DMTI target and cross-cue the target to Predator B’s Electro-Optical/Infrared (EO/IR) sensor Field-of-View (FOV) was demonstrated. The new Lynx Multi-mode Radar is a two-channel variant of the existing single-channel Lynx Block 20 Radar. It utilizes enhanced radar techniques and a Space Time Adaptive Processor (STAP) that permits a target to be imaged using a matrix rather than a linear array. This is a significant technical enhancement that improves the radar’s MTI capabilities, enabling the detection of people. General Atomics Aeronautical Systems, Inc., an affiliate of General Atomics, delivers situational awareness by providing remotely piloted aircraft, radar, and electro-optic solutions for military and commercial applications worldwide. The company’s Aircraft Systems Group is a leading designer and manufacturer of proven, reliable remotely piloted aircraft systems, including Predator A, Predator B, Gray Eagle, and the new Predator C Avenger.